›Kingston Brass DR914166 Camelon Decorative Grab Bar, Polished Nickel - 15.27 x 12.29 x 2.74 in. 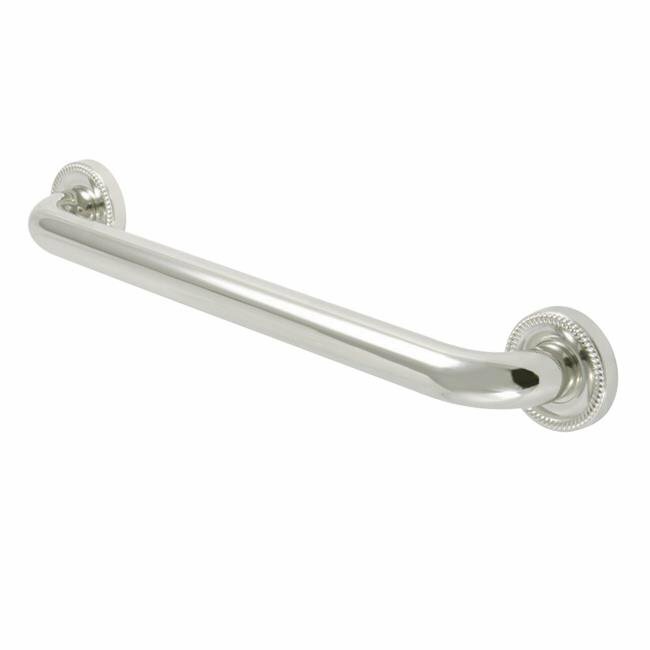 Kingston Brass DR914166 Camelon Decorative Grab Bar, Polished Nickel - 15.27 x 12.29 x 2.74 in. The Kingston Brass Camelon 16-inch grab bar combines 17 gauge brass construction and bold styling when a decorative safety grab bar is needed. Easily installed next to shower, tubs, or toilets, this grab bar features a 1-1/4'' gripping surface ensuring this product meets all ADA standards. All mounting hardware is included and is concealed after installation for a sleek look. This grab bar projects 3'' from the wall in 4 tarnish and corrosion-resistant finishes: Chrome, Polished Brass, Oil Rubbed Bronze, Polished Nickel, Satin Brass or Satin Nickel. This stylish grab bar adds to the look of any bathroom and provide an excellent added safety measure.